Does anyone really know what this book is about? I mean, we hear the name all of the time as the punchline of a joke. "Man, I could have read War and Peace in the time it took to finally see the doctor." But does anyone know what the hell the book is about other than "Something to do with war and peace in Russia during the 1800's." This is one of four pages for the names. Honestly, I knew nothing about this book before I picked it up. Nothing. Not the characters or the plot or any damn thing. I'm only 63 pages into my edition so I still don't know anything about this book. Napoleon is a pivotal plot point so far. He's all the characters talk about. Reading The Count of Monte Cristo prepared me somewhat for this approach. Without that book I really wouldn't have any interest in Napoleon or that time period. It does help to understand just what type of threat Napoleon was to people at that time to really "get this." For the most part, all of the characters are just eating and talking and meeting. That's the story so far. Some of the characters speak French and the version I have (translation by Richard Pevear and Larissa Volokhonsky) shows the French lines of dialog with the translations at the bottom of the page. Plus there are the additional notes found at the back of the book. There's a lot of page flipping involved, but it's really heavy during the first five chapters. The first page alone involves three translation notes and one trip to the back of the book. The names of the characters are also a point of trepidation. 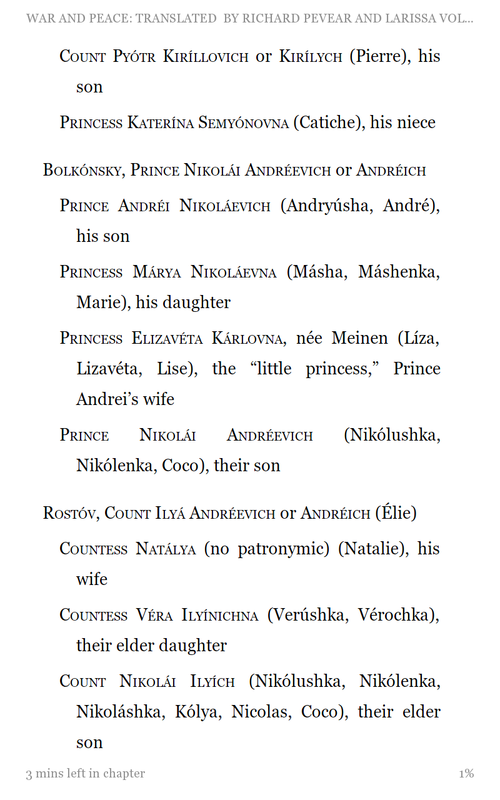 The characters have names written in French and the transliterated Russian. 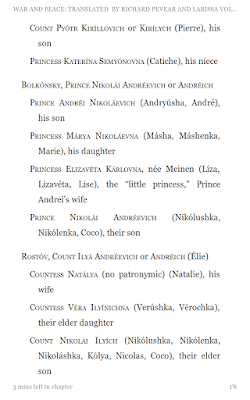 Each characters also have titles and diminutives (or nicknames... and sometimes multiple ones) and things can get confusing quickly with so many counts and countesses and princes and princesses that are frequently called by different names. But don't be intimidated. I mean, if I can start this trek then anybody can. Approach this one word at a time. The first five chapters are a tough slog of page flipping, but taking notes and having a printed character sheet with the names and titles helps. I also find this translation easy to read even with the page flipping. I'm looking forward to reading more of this book.